This was my second visit to this church, the first being a brief glimpse just before it closed one evening. 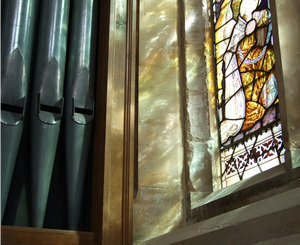 Here, in the morning, the sun shines through the east windows of the church, casting coloured light through the stained glass onto the old stone, and the church organ alongside. 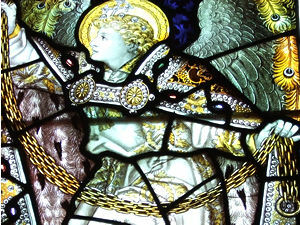 This window is one of four in the church by the Victorian stained glass artist Charles E Kempe. I’ve noticed the church door open many times, but it’s only this year that I’ve wandered in. It’s a beautiful church. This Victorian stained glass is very handsome, all along its east end, and these windows, and the blue-painted roof, and the clerestory windows, make it bright and welcoming. The church is mentioned in the Domesday Book. The present building dates from the 14th century, with additions over the centuries. The church’s position in the middle of much-used roads led to it losing its original chancel for street-widening – in 1782 – proving that traffic problems and road-widening needs aren’t exclusively concerns of the modern age. These photos show details of gilded woodwork I noticed as I was wandering happily about. The image on the far left is from the font cover – (which was quite tall, so I didn’t try to reach up to dust off the cobweb which is just visible in the photo). 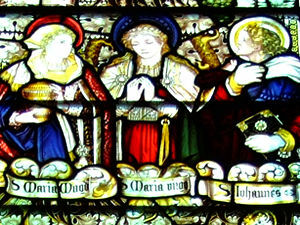 These details are from the east window, a Victorian window also by Kempe, showing a host of saints. 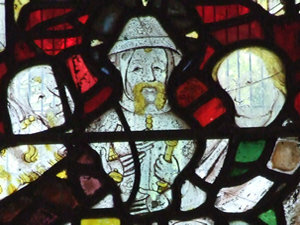 Though there are many stained glass windows in this church from more recent centuries, grabbing the attention with their brightness, the west window is late 14th century glass, carefully reassembled here. 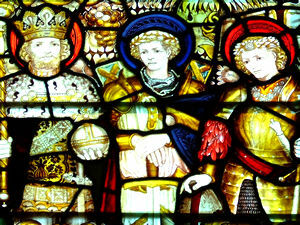 The glass was originally from the nearby St Saviour’s, now a "redundant" church no longer used for worship. 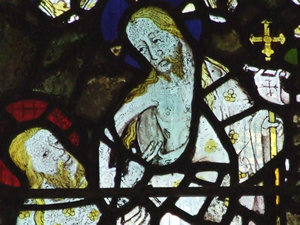 It took two years of work by the Minster glaziers to relocate and reconstruct the window here in All Saints. It depicts scenes from the Passion. 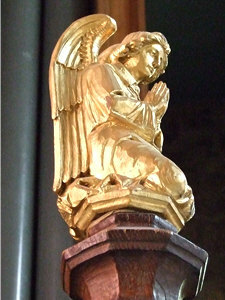 The church’s pulpit is a tall, imposing, ornate structure, by Nicholas Hall, dating from 1634, with a tester or sounding board above it, designed to amplify the voice. John Wesley, co-founder of Methodism, preached from here several times. 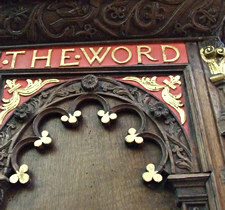 Details from the carved and painted biblical texts decorating its sides are pictured. 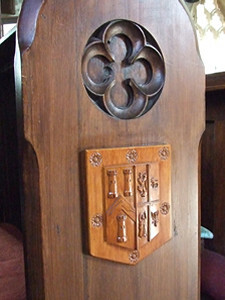 On the ends of the pews are wooden shields of the city’s Guilds. The church’s stained glass includes a window in honour of the armed services, as All Saints is the regimental church of the Royal Dragoon Guards. Previously I’ve often admired this church from the outside, and these photos of the exterior were taken last July, during an early morning walk. 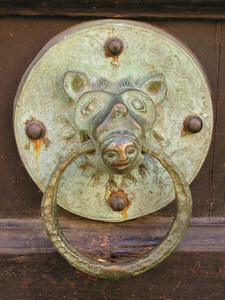 The knocker on the church door shows a lion swallowing a bearded head. 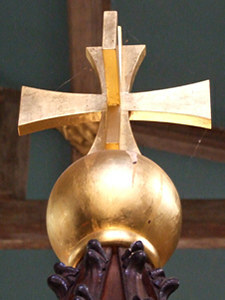 This is a replica of the original, dating from the 12th-13th century, which is now in the Minster treasury. 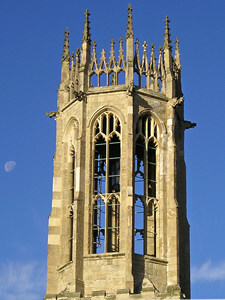 The octagonal lantern tower of All Saints is one of the finest in England. Apparently, in the old days, when all the land beyond was wild and dangerous, a light in the tower used to guide travellers in from the Forest of Galtres. Background information came from – Yorkshire: York and the East Riding (Pevsner Buildings of England), by Nikolaus Pevsner and David Neave; from York (Bartholomew City Guides) by J Hutchinson and D M Palliser (apparently no longer in print); and from the leaflet available within the church. 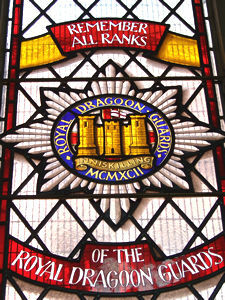 More information on the Royal Dragoon Guards window.